Oh man, this page though. 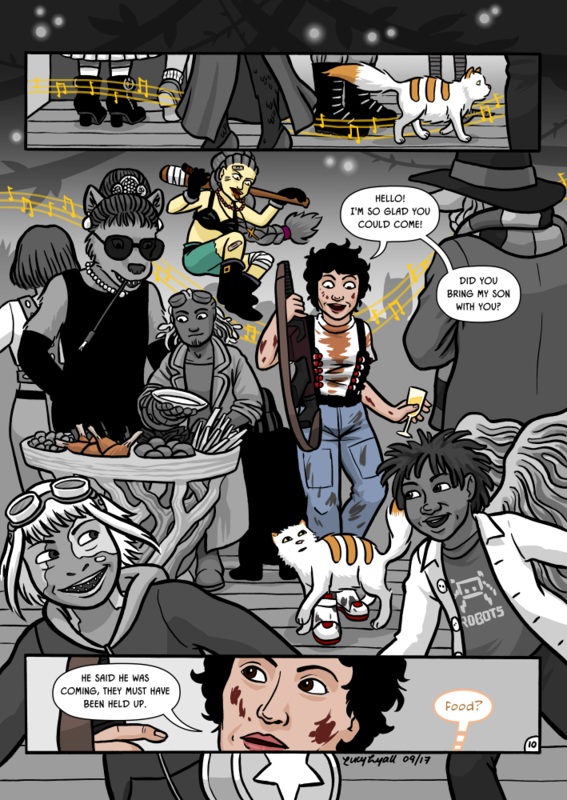 The story behind it is that Amy said Fat Cat should go to a party at Julies place with loads of weird people, and I was all like 'hey, wouldn't it be cool if it was a fancy dress party? ', and she said that was a great idea. Which is was, right up until I had to draw it. Then I realised I had to design each character twice, including researching the outfit for them, and then draw all the fuckers. The stupidist thing is, what with the greyscale, and my tendancy to pick slightly obscure references for this kind of thing, I'm guessing one half to three-quarters of these outfits will not be recognisable. I should have just dumped them all in Marvel / DC superhero costumes and had done with it. BUT WHATEVER, it was still fun to do, even if it took rather longer than it should have. - Various other legs I made up, because who has time to research distinctive legs? ... obviously, the guy bottom right is dressed as Flint Lockwood from the film 'Cloudy with a Chance of Meatballs'. I MEAN, WHO ELSE, RIGHT?